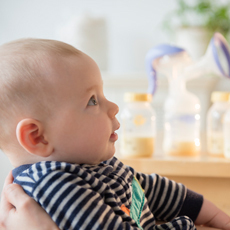 If you are considering supplementing breastfeeding with formula or completely switching to it, this information can help with the transition. When you start to supplement with formula, it is possible that she might refuse the bottle. Try to prevent your baby from confusing your breast with the bottle. Your baby associates your smell with breastfeeding and might be confused if you are the one to give that first taste of formula. When your baby tries formula for the first time, it might be best to have the father give the bottle. Also, it might be better if you are not in the room. Knowing you are around will make it more likely that your baby will hold out for breastfeeding. Your baby will drink faster from a bottle than from your breast, that’s just physics. 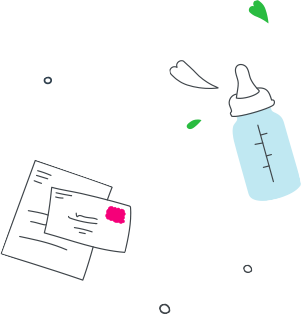 Once your baby begins taking feedings from a bottle, you might be surprised at how quickly she finishes. This happens because the bottle delivers milk and/or formula faster than your breast so it is not necessarily a sign that your baby is hungrier than usual. Also, be sure to try to get a burp midway through the feeding, if possible, and definitely after the feeding, to relieve the pressure that can arise in your baby’s stomach from quicker feedings. Also, for obvious reasons, it might be a good idea to put a cloth over your shoulder when you do it. Since formula takes longer to digest than breast milk, your baby will feel full longer, so you will notice her feeding less frequently. Consistent feedings are still important, though. Waiting too long could affect your baby’s health (and temperament). Watch for your baby’s cues and try to establish a rhythm that suits you both. One of the definite downsides of moving on from exclusive breastfeeding is what you find in your baby’s diaper. We sympathize, but just grin and bear it, there is no other solution. Your baby may pass fewer stools, but they will probably be bulkier and smellier. If your baby gets constipated (consistently passes stools that are hard and dry), you may want to look at using an infant formula with galactooligosaccharides, a type of dietary fibre. Similac® Advance® contains galactooligosaccharides and helps promote softer stools, similar to breastfed babies. Health Canada. List of Dietary Fibres Reviewed and Accepted by Health Canada’s Food Directorate. Revised December. 2013. Consult your health care professional if you are concerned. Do not use over-the-counter stool softeners unless advised by your health care professional. 5. What about your milk supply? Once your baby gets used to the bottle, she might prefer it to the breast. Do not take this personally, it is just that the bottle delivers milk faster. If this happens, try breastfeeding when she is sleepy. If your milk supply is diminishing, pumping might increase your production.